Myrrh Powder has been used medicinally for over 2,000 years because of its believed antiseptic, detoxifying and anti-inflammatory properties. It is very popular in soap and facial masks, as it is believed to reduce blemishes while calming and rejuvenating tired skin. Customers will love the natural look of this soap and the sweet all natural honey and vanilla scent. You Save $27.45 by purchasing this kit rather than buying the items separately. COMMENTS: This is hands down my favorite soap kit. I have extremely dry eczema inflamed skin. This soap has done wonders to sooth it. They are beautiful and customers love them as their daily facial and bath bar. "This is a great kit "
COMMENTS: This was easy to make and came out perfectly the first time. The soaps look very nice and smell lovely. COMMENTS: A very easy to use kit-the instructions are easy to follow. The soap cured to a beautiful color. Everyone who tried it liked it. I will be making many, many more of these. COMMENTS: I loved this Honey kit! I bought it for a girls night in, and it was a hit! It was extremely easy to make so the first time crafters had no problem doing it. Loved the wonderful honey smell, I can't wait to make some more. COMMENTS: I'm slowly working my way up to more complicated soaps, and I decided this was the next step up for me. It had more steps and more things that could go wrong than anything Iv'e made before, but the clear instructions made everything go smoothly and easily. I didn't even notice how easy it was going until I was done. The scent is lovely and while I intended on gifting these, I may just keep them. COMMENTS: I used this and made facial soap and facial exfoliating bars. My customers are loving it. Best seller. • Everything mold soap base. COMMENTS: Love love love this kit. The soap suds a lot and is really foamy but gentle on the skin. Not drying and the Myrrh gum powder is an excellent mild exfoliant. I really love what this soaps does for skin it clears my acne and blemishes. Will definitely be purchasing again! COMMENTS: These soaps were so easy to create and turned out so pretty. Unlike the description, our soaps did not turn darker over time. It's been over a month and they never got darker so to fix this, we just added a tiny bit of the myrrh powder to the first layer of soap until we got a light brown color. We thought that it looked much better this way :) Love the light scent and they made wonderful gifts. COMMENTS: Loved everything about the kit except the FO. I find the scent to be too light. After soap was hardened there was no scent at all. The kit is a great purchase for anyone not just someone new to making soap. COMMENTS: This soap is amazing. Helps keep my face clear, and its so easy to make. "Honey Facial Melt & Pour Kit"
COMMENTS: This was the first M&P kit I have purchased. It was nice to have all of the ingredients and directions in one package. It made it very easy to try a new product and see the end results without buying bulk of many ingredients. I will buy more kits in the future. This would be great for a party or to soap with friends. • All ingredients in one package. • Directions included with the kit. • Make a larger quantity. COMMENTS: I enjoyed this project!! The results looked professional but the fragrance was hardly noticeable.. I used another fragrance oil in the remaining bars and they looked and smelled amazing.. COMMENTS: Fairly straight forward directions. This was my first attempt at working with melt and pour soap and it went fairly well. The tricky part is waiting long enough so that the two layers don't mix. But even the bars that had some mixing, worked great and had a really neat appearance. "This is a facial acne soap that looks very organic"
COMMENTS: I really love this kit, comes with everything you need. Instructions are very clear and helpful. You'll have leftover raffia which I used for lavender soaps. My aunt loves these honey facial bars, she is requesting more :) only thing is now I have to buy another mold because this one cracked after the second batch and by the fourth and final batch I had to toss it, I didn't even put it in the freezer either. COMMENTS: Very happy with how it turned out. "My 45 year old daughter's favorite for break outs"
COMMENTS: This was one of the first soaps I made. I bought the kit because it was inexpensive. I keep buying the kit because my oldest daughter keeps swiping it from me before I can get it up for sale. She swears that it makes her break outs vanish overnight. Now, her son and her teen-age daughters are in line for it too. 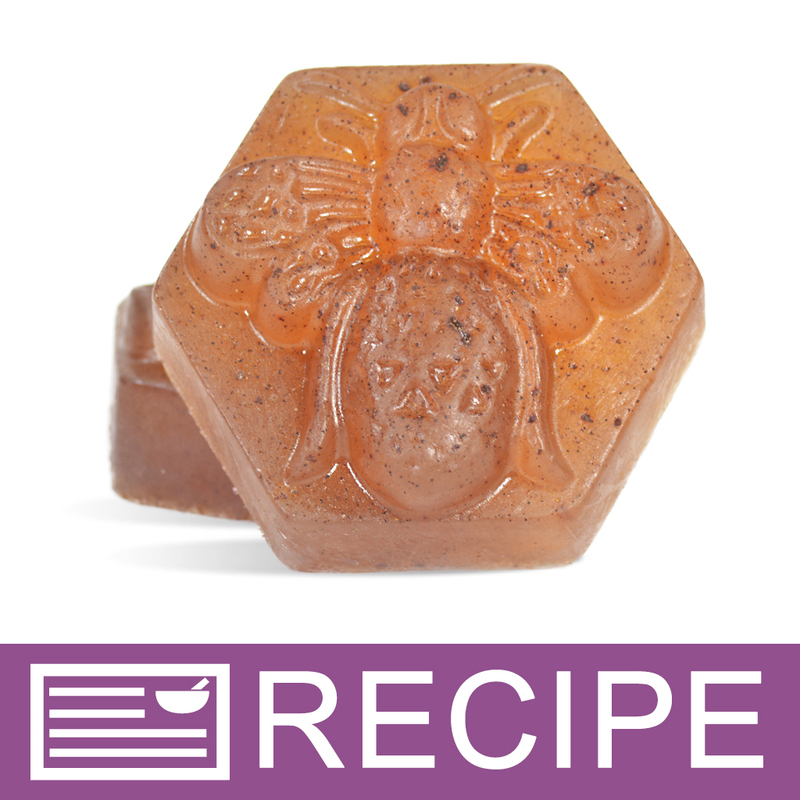 It is so very easy to make and smells yummy as well as looking so rich with the detergent free honey base and the myrrh gum powder additive. I love the mold that came in the kit. The honey bee is a pet topic of mine. I garden and really appreciate those honey bees and the job they do of spreading the pollen's among the blooms. When the kit is in stock, I try to get a couple of kits. I never want to run out of this one. COMMENTS: These came out beautiful and I appreciated the packaging that was included. I wasn't familiar with the smell of the powder so it's not my taste but the soap lathers well. COMMENTS: Great end result with this kit! The myrrh powder can be a little difficult to mix completely so be patient. Use small whisk like blender for best results. Nice product WSP. Thanks so much! COMMENTS: This was easy to make with impressive results. The result is almost exactly like the picture. I gave a few of these bars out to some co-workers and had other people asking how much I sell them for. I have used this soap and it lathers and works well, it has now replaced my face wash. COMMENTS: Great kit, very easy to follow, I added just a bit of my on spin and no issue with mold or final product. "Will these bars fit in the square soap box with window cut opening?" Staff Answer This soap bar will fit in the square soap box very nicely. "How long does it take for the clear layer to turn color? I made these a week ago and they haven't changed color at all. " Staff Answer The color change will vary. Both layers of the soap should have a slight golden hue due to the Honey Soap Base. The color may continue to change up to even a month after creation. "The fragrance oil used in this kit contains vanilla, but color stabilizer is not in this recipe. Is it not needed?" Staff Answer The fragrance that is used in this recipe only contain 0.50% which may only slightly discolor your bar, for this product we loved the way it turned out! You can add a stabilizer if you prefer but we chose not to in the recipe. 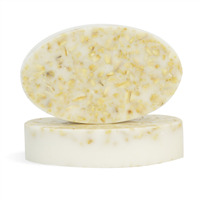 "The high relief on this honey bee is super cute and I am happy with the soap. However I haven't found a way to package it. I tried the shrink bags, but hair-dryer heat distorted/melted the soap, losing the effect of the high relief. Putting it in a bag loose doesn't appear very elegant. Advice appreciated!" Staff Answer Our best recommendation would be to continue to use our shrink bags but make sure to keep the heat further away from the soap bar. If you are currently using a heat gun you may want to switch to a hair dryer for more steady heat. Another alternative is to wrap it tightly with plastic wrap. "How many bars of soap does this kit make? Is there a recommended price?" Staff Answer It makes (10) 3 oz bars. "How would you package these? Don't they need to be wrapped/sealed as they are a melt and pour?" Staff Answer This kit uses the Detergent Free Honey Soap. Detergent Free Honey Soap Bases do not need to be wrapped. We simply tied two soaps together with raffia which is included in the kit. You can package them in a cello bag or wrap them in plastic wrap if you prefer. I like to wrap all my soaps, especially if they are going to be handled a lot. Neatly done shrink wrap doesn't ruin the look of the product. Now if I were handing this off as a gift, the tie is very cute. "Are these considered all natural? " Staff Answer No. The Detergent Free Honey MP Soap Base is not a natural soap base. Therefore the finished soaps cannot be labeled as "All Natural".